And if you're currently looking around for something new to stick on your wrist, you're in luck. A bunch of new smartwatches and fitness wearables launched at Europe's biggest tech show last week, and we've put together a collection of our favorites. Check them out below, and be sure to look out for a full review of each one very soon. Samsung's next big smartwatch upgrade isn't the most exciting new wearable launched at IFA 2017, but you can take it for a swim, unlike previous iterations. The design has been refined, and for the first time there's offline Spotify support, which means you can upload Spotify tracks directly to your watch so you don't have to take your phone out while you're running. There's built-in GPS, and one of the new fitness features gives you workout plans that you can even cast to your TV if you're working out at home. The Fitbit Ionic was announced just before IFA 2017 kicked off, as the company wanted to get ahead of all the other announcements. It's the very first smartwatch made by the company – and we like what we've seen. 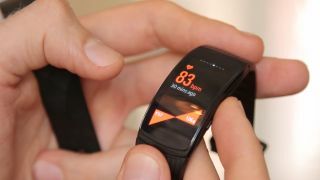 It has expanded fitness features, including workouts you can do straight from the watch, there's built-in GPS, and a new and improved heart rate tracker is claimed to be its most accurate ever. A variety of apps will be available on the Fitbit Ionic too, with third-party developers working on the platform as we speak. You won't have to wait long for our full review to see if the £299.95/$299.95/AU$449.95 asking price is too much money. Garmin's latest watch still focuses on the fitness elements by including tracking for lots and lots of different exercises, but it's closer to a traditional smartwatch than anything else the company has made previously. Personalized watch faces are available, and you've got the choice of two versions: one with a plastic body and another with a more premium metal design. Garmin's new Garmin Pay tech also means you can connect your phone with your bank account and tap on contactless payment readers to pay while you're out and about, in a similar way to Android Pay and Apple Pay. The Q Venture may be the best wearable launched at IFA 2017 for those with smaller wrists. It comes running Android Wear 2.0 but has a smaller design than a lot of the other watches running the same software, and it sports a premium build. At $255 or £260 this is one of the cheaper Android Wear watches, which may make it the perfect smartwatch for you when it comes out at the end of September. The Gear Fit 2 is one of our favorite fitness trackers in the world right now, but Samsung may be about to bump it from that list with its new Gear Fit 2 Pro announcement. Samsung's latest fitness tracker includes swimming support so you can take it in the pool with you, plus there's offline Spotify (as on the Gear Sport), so you can upload songs directly to the band and take them with you wherever you go. On top of that there's built-in GPS support and a variety of other fitness-based feature. Other wearables announced at IFA 2017 include the Diesel On, TicWatch S, Garmin Vivomove HR, Garmin Vivosport and the Samsung Gear Icon X 2018.